Records and Recollections of Alexander Boyd & Co. Ltd. I decided to write this short, sketchy history of Alexander Boyd and Company, Ltd. for a variety of reasons. It seemed sad that the considerable part Boyd's had played in the affairs of Lisburn for over a century should go unrecorded and it seemed unlikely that anyone else would have the knowledge, the time and the inclination to undertake such a task. I do not pretend to have any ability as a historian or as a writer but I do have an intimate knowledge of the affairs of the Company gained in the near thirty years I have been a director. All of this may well be forgotten even before I die. So here it is for what it is worth. A story essentially of a shop that survived the changing fortunes of commercial life for over a hundred years, and of its custom­ers and of all those people who worked in it over the years and made it all possible. It is not, I know, well done ‑whether it was worth doing, I leave to the reader to decide. I wish to acknowledge with many thanks the help and advice given by Mr. Tony Croley of Nicholson and Bass Ltd., in the production of this book and by the Lisburn Historical Society in its distribution. Alexander Boyd and the Early Years. Alexander Boyd was a druggist but, as was customary in those days, his business ranged over a much wider field. Druggist, grocer, wine merchant, spirit dealer, insurance agent, his varied business grew and prospered. So much so that in 1871 he opened a second shop at No. 19 Market Square, Lisburn which, according to the opening announcement had been "fitted up in the most approved manner". Also in the announcement he begged to thank his friends for the large share of favours he has received since commencing business and solicits a continuance while he pledges himself to unabated efforts to merit same. He continued to prosper and, although no figures are available, there is evidence to suggest that his annual profits were around £1,000. Of course labour was cheap in those days and for the first ten years the business was run mainly with the aid of apprentices whose terms of service-five years and £5O -would these days hardly be termed princely. In 1871 when he opened his second shop Alexander Boyd employed six apprentices and three assistants whose wages were in the region of £50 per annum. "I have heard that yon are looking after my customers in a pretty general way lately. Well, I don't deny the right of any one to do the best for themselves but they should first do honest themselves .I will be obliged to you for the amount due by you to me. In the event of it not being paid within one week I shall think it my duty to protect myself in a manner perhaps not agreeable to you. On 21st September, 1872 an event of great significance to the future of the firm occurred in the appointment of James Andrew Hanna as an assistant. James A. Hanna also came of farming stock and was born in 1852 in Ballydougherty, Co. Armagh. He served his apprenticeship to the grocery trade in Henry's of Castleblayney, Co. Monaghan. Although he was only twenty years old when he came to Lisburn he was soon to become more of a manager than an assistant and Alexander Boyd gradually came to rely more and more on the young man. Indeed by 1878 James A. Hanna was virtually running the business. Alexander Boyd, a popular and convivial resident of Lisburn, had other things to do. The merchants of Lisburn, had a more leisurely life in those days. Although hours were long the normal practice was to spend the afternoon discussing the affairs of the day with one's cronies in one of the local hostelries or the News Room. In 1867Alexaner joined St. John's Masonic Lodge No. 178 of which a John McBride was Secretary and John Reid, Worshipful Master. The Lodge was favoured by the merchants of Lisburn and no doubt Alexander Boyd found himself among friends. Indeed he was to become Worshipful Master on two occasions, in 1872 and 1877. On 1st November, 1874 Alexander Boyd bought "Thornhill" from John McBride, presumably the Secretary of the Masonic Lodge, for £810 held forever at a yearly rent of £6.10.0 payable to Sir Richard Wallace, the Marquis of Hertford's successor. "I see you admit a responsibility-which had you done sometime ago 'The Friends' might have taken advantage of until things settled themselves. l have been treated to too much 'craft' and too little candour. All in Lisburn know I am incapable of an act of unkindness …. One of the gentlemen of your committee calling upon me can settle the matter in five minutes". Presumably this is what happened because there is no more mention of the matter. Early in 1877 Henry Major, Alexander Boyd's friend and business associate died. As well as being a dealer in wines and spirits he was agent for a number of Insurance Companies and Alexander Boyd from then on appeared to become more concerned with this side of his business. In June 1879 he negotiated insurance cover for the Railway Hotel, Railway Street, Lisburn. This was to be expected because, although Alexander Boyd owned "Thornhill" he lived most of the time in the Railway Hotel, finding it no doubt a convenient place in which to indulge his ever increasing desire for alcoholic refreshment. It was there on a Sunday morning in July the following year that he died in the arms of his friend and colleague, James A. Hanna. He was buried in the graveyard at Bailiesmills Reformed Presbyterian Church outside Lisburn. In his will Alexander Boyd left 'Thornhill' and his business to his sister Jane. 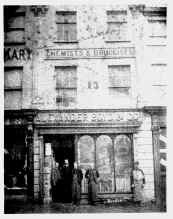 Jane was married to James Alister who owned a hem-stitching business at 25 King Street in Belfast. After his marriage James came to reside in Lisburn, first in Stannus Place, then in Bachelors Walk and eventually in 'Thornhill'. So in July 1880 the situation was that Alexander's business was owned by his sister Jane but run by James A. Hanna. 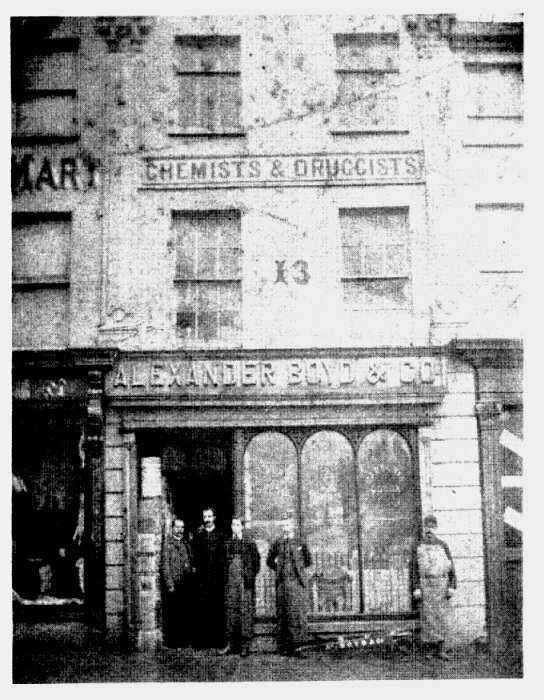 James Alister had his own business in Belfast and in any event knew little about the drug, wine and grocery trade. So, to ensure that the very profitable business would continue, a partnership was formed between James Alister and James A.. Hanna to continue the business, at this time in Market Square, under the style and title of Alexander Boyd & Co. The Cross Row shop was presumably let and presumably became the property of Jane Alister. Certainly it was let in 1876 to a Mr. Parkinson at £24 per annum. At the time of his death. Alexander Boyd had in his business stock valued at £4,234.6.0 and debts due to him of £2,200.18.0. On the other hand he had accounts amounting to £5,433.7.9, leaving a balance due to his estate £1,001.16.3 The partnership therefore acquired the goodwill of the business, stock-in-trade an the debts due to Alexander Boyd and took over responsibility for the accounts due. The balance of £1,001.16.8 became the capital of the partnership. This was allocated between the partners, James A. Hanna's share being £54.10.0 the amount of salary due to him at Alexander Boyd's death and the balance £947.6.8 being James Alister's share, left presumably by Alexander to his sister Jane. Although these are the figures which formed the base for subsequent calculations they are not in accordance with the partnership agreement made on 26th March, 1881 but dated 1880. According to the agreement the capital of the partnership was £1,500 all provided by James Alister. The difference is probably accounted for by an agreement between the partners to set off the value of fixtures, etc. against any loss in the collection of debts due. The three most important provisions in the agreement were, first, that the profits were to be divided equally between the partners without reference to the capital provided, second, that each partner was to be paid a salary of £200 per annum in exchange for giving his exclusive time and attention to the business and, third, that the capital of the partnership could by agreement be added to at any time by either of the partners. Subsequent events were to show just how important these provisions were. The partnership was to last initially for ten years. The new venture was a great success. Profits for the year to 31st July 1881 amounted to £1,164.9.1. James Hanna's drawings for the year, an impecunious young bachelor, were £65.10.0 while James Alister drew £198.0.1, both men adding considerable sums to their capital accounts. This pattern continued throughout the decade. Surplus funds were put on deposit in the Northern Bank and, oddly enough, in the Standard Bank of South Africa. Money was lent to Andrew Millar and Co. Ltd., Jam Manufacturers of Belfast and a number of houses were bought in various parts of Lisburn. One of these was Castle View, a villa on the North Circular Road purchased in 1883 for £525. In 1886 this house was bought from the partnership by James A. Hanna who in 1885 had married Isabella McComb, the daughter of an Antrim doctor. They lived in this house for all their married life and, indeed, their elder son lived in it afterwards until 1948 when he went to live in Donaghadee. During this period a branch shop was opened at No. 35 Market Square, Lisburn. An advertisement in an Ulster Directory published in the eighties lists the occupations of the firm as Grocers, Tea and Coffee Dealers, Druggists and Wine & Foreign Produce Importers. The tea was strong, pungent and rich flavoured, the family medicines strictly pure and full strength and the old Douro port wines of choice bouquet and fine flavour, eminently suitable for invalids. The acquisition of more commodious premises was the next aim of the flourishing partnership and in July 1888 tentative offers were made for the purchase of two other shops in Market Square. These negotiations were unsuccessful but in June the following year Dr. Samuel Musgrave's house and dispensary at the corner of Railway Street and Castle Street together with three houses in Castle Street were bought for £700 and a yearly rent for ever of £100. This was a long established dispensary. It is referred to in the reminiscences of Mrs. George Wilson, an observant lady with a vivid and fairly accurate memory who lived all her life in Lisburn. She remembered it as, in 1858, having two bow windows with black glass in the lower half and coloured bottles above. At that time, she recalled, Dr. Musgrave had a house-keeper and an old manservant who was known as 'Dr. John'. Ten years after this purchase the offices next door in Railway Street occupied by R. H. Berryhill were acquired from the Musgraves for a rent of £40 per annum. This was from Sir James Musgrave, Baronet, brother of the doctor, who lived at Drumglass House, Belfast. The Musgraves were very successful businessmen. James became the moving spirit behind a firm of iron founders and engineers. Samuel followed in the footsteps of his father, also Samuel, in becoming dispensary doctor in Lisburn. Dr. Samuel, Senior, first set up shop as a doctor in Bridge Street, Lisburn in June 1790. He was a supporter of the United Irishmen and was in due course arrested for high treason and brought to Dublin. It is said that he was treated leniently because he used his medical skills to save the life of the jailer's wife –poetic justice? 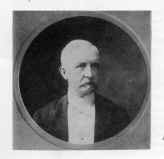 He died in 1884 and Dr. Samuel, junior, died in 1893. Two other sons, Henry and Edgar, founded the tea and sugar importing firm of H. and E. Musgrave. The author, Forrest Reid, was an apprentice in the firm and had this to say of them:-"Though generosity was not a Musgrave characteristic I liked Henry: towards his brother, Edgar, when I watched him saving the backs of envelopes and lifting little bits of string from the floor, my feeling was more of curiosity". However they were generous in other directions, presenting Musgrave Park, Musgrave Clinic and Riddel Hall to Belfast and the. statue of Brigadier General John Nicholson to Lisburn. The last of the Musgrave, Henry, died on 2nd January 1922. Five years earlier he was made an Honorary Burgess of the City of Belfast Of more immediate interest, in January, 1919, he transferred the remainder of the Musgrave property in Railway Street to Boyd's for a rent in perpetuity of £125 per annum, and to bring this story back to its place in the scale of time-more or less-in 1891 Boyd's owed Musgrave's for tea and sugar £820, in those days a sizeable sum. Reverting to Dr. Musgrave's house and dispensary, steps were soon to be taken to make use of the newly acquired property. In May 1889, George Sands, a local architect was commissioned to draw up plans and estimate the cost of a new building. The contract was given to Messrs. D. and P. MacHenry and the erection of Castle Buildings, in the words of a contemporary reporter "One of the must complete, extensive and ornate establishments to be found in any provincial town in Ireland" was soon under way. In November 1890 the new premises were opened to the public. Castle Buildings was truly a magnificent achievement. The shops were finished in pitch-pine, the elaborate fittings being of oak, walnut, mahogany and ebony with mirror panels. Electric lighting was used-quite an innovation; eight arc lamps of 1,000 candlepower, six of them outside the building, were supplied with current from a generator driven by a Crossley gas engine. Interior lighting was from wrought iron gas brackets, there were speaking tubes in the shops to the stores upstairs and a hand-operated hoist was used for the movement of goods to and from the two large stores on the first and second floors. The goods entrance was from Railway Street, using part of the present Pharmacy and there was a stable on the first floor in a store in the yard, access being by a wooden ramp. The gas engine had a heavy stone wheel which was started by hand. Hector Hanna, elder son of James A. Hanna, recalls that his father used to start the wheel himself and came home with his veins swollen by the strain. The old wheel is still to be seen in Castle Buildings yard. The fine carved wood fittings, alas, are no more but the building itself, nearly ninety years later is as impressive as ever. It is doubtful if ever again will be seen such quality of workmanship in a commercial building or the erection of a similar building in such startlingly short time, about twelve months.